Producer: Mirza Pasic; executive producer: Milan Martinovic; co-producer: Harry Saltzman; screenplay: Emir Kusturica, Gordan Mihic; photography: Vilko Filac; editor: Andrija Zafranovic; assistant directors: Maja Gardinovacki, Dragan Kresoja; production design: Miljen Kljakovic; music: Goran Bregovic; sound: Gordana Petakovic, Ivan Zakic, Srdan Popovic, Theodore Mitchel Yannie, Mladen Prebil. Cast: Davor Dujmovic ( Perhan ); Bora Todorovic ( Ahmed Dzida ); Ljubica Adzovic ( Baba ); Husnija Hasmovic ( Uncle Merdzan ); Sinolicka Trpkova ( Azra ); Zabit Memedov ( Zabit ); Elvira Sali ( Daca ); Suada Karisik ( Dzamila ); Ajnur Redzepi ( Perhan's son ). Awards: Best Director, Cannes 1989. Horton, Andrew, "Time of the Gypsies," Writing the Character Centered Screenplay , Berkeley, 1994. Horton, Andrew, "Ethnic Godfathers and Grandmothers: Emir Kusturica & Time of the Gypsies 's Balkan Makeover of Coppola's Godfathers" in Play It Again, Sam: Retakes on Remakes , edited by Andrew Horton & Stuart McDougal, Berkeley, 1996. Bertellini, Giorgio, Emir Kusturica , Milano, 1996. Variety (New York), 17 May 1989. Brisset, S., and G. Ptillat, Cinéma (Paris), October 1989. Grugeau, G., "Entre ciel et terre" in 24 Images (Montreal), Fall 1989. Gauthier, G., Revue du Cinéma (Paris), November 1989. Gili, G.A., and others, "Emir Kusturica" in Positif (Paris), November 1989. Katsahnias, I., "Freaks, freaks. . ." in Cahiers du Cinéma (Paris), November 1989. Insadorf, Annette, "Gypsy Life Beguiles a Film Maker" in The New York Times , February 4, 1990. Brown, G., Monthly Film Bulletin (London), April 1990. Beauchamp, M., and G. Grugeau, "La quête du pays" in 24 Images (Montreal), Summer 1990. Schupp, P., Séquences (Montreal), June 1990. Feldvoss, Marli, in EPD Film (Frankfurt), September 1991. Binder, David, "A Bosnian Movie Maker Laments the Death of the Yugoslav Nation" in The New York Times , October 25, 1992. Iskusstvo Kino (Moscow), December 1992. Dakovic, Nevena, "Mother, Myth, and Cinema: Recent Yugoslav Cinema," in Film Criticism (Meadville), vol. 21, no. 2, Winter 1996–1997. Wrathall, John, "Gypsy Time," in Sight & Sound (London), December 1997. Rouyer, Philippe, and Michel Ciment, "Emir Kusturica," in Positif (Paris), October 1998. "Misdirected Pride (Bosnian Filmmaker Emir Kusturica)," in Economist , vol. 351, no. 8115, 17 April 1999. Horton, Andrew, "'But to Have Dreamed It All': The Balkans' Healing Irony (Balkan Cinema)," in Chronicle of Higher Education , vol. 45, no. 43, 2 July 1999. It is one of the ironies of contemporary cinema that one of the most celebrated filmmakers anywhere is Emir Kusturica, a Bosnian Muslim from Sarajevo, who has been able to draw upon his rich yet troubled former country to weave memorable tales of humor, horror and pathos, all under the banner word he calls "joy." When Father Was Away On Business won the Palm D'Or at the Cannes Film Festival in 1985 as a powerful tale about the survival of a Muslim family under the anti-Stalinist terrorism in Yugoslavia in the 1950s, and he won the Palm D'Or a second time in 1995 for Underground , a darkly carnivalesque vision of the breakup of Yugoslavia mixing equal doses of realism and Balkan surrealism. 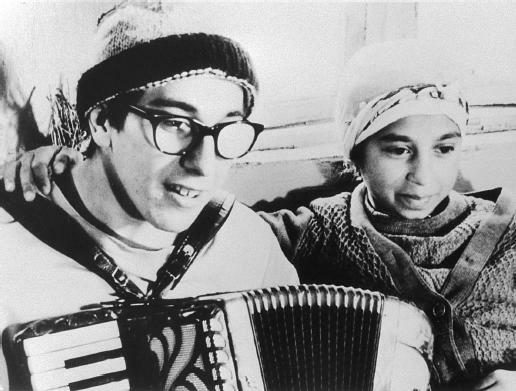 And Time of the Gypsies won the Cannes Best Director Award in 1989 for this exuberant yet pessimistic narrative based on a true story of Yugoslav gypsies selling their own children into a form of slavery in Italy. An appreciation of Kusturica's film today, of course, comes with the uneasy awareness of how strangely cinematic narratives can sometimes foreshadow history. For while Kusturica's tale which echoes Coppola's Godfather trilogy in a number of ways does not speak of ethnic cleansing and religious intolerance, the forces of chaos suggested in the film do seem to provide some insight into the horrors of the current Bosnian and Balkan conflicts. soon-to-collapse Yugoslavia. He also took a chance on a number of gypsy actors and actresses including the wonderful Hasnija Hasmovic who plays an almost mythical Earth Mother-Grandmother figure at the center of everything in the film. At its core, Time of the Gypsies is a coming-of-age story in line with Kusturica's previous work including Do You Remember Dolly Bell? (1981), his first feature, which tracks a teenage Bosnian Muslim would-be rock star through his first love and sexual experience in 1970s Sarajevo. Similarly When Father Was Away on Business follows an eight-year-old son who is trying both to grow up and hold onto a childhood in a world fragmented by political, religious and ethnic hatreds. Writing with one of Yugoslavia's most talented screenwriters, Goran Mihic, Kusturica fashioned in Time of the Gypsies a tale of young Pehan who passes through the joy and heartbreak of first love onto his rites of passage as a gypsy gangster protégé of a flamboyant gypsy Godfather played with memorable brio by Yugoslavia's John Wayne-like icon, Bora Todorovic. Kusturica and Mihic draw strict tensions between the orphaned Pehan's love for his grandmother who is raising him and her centered life in Yugoslavia, and his desire to help his ailing sister by working as a pickpocket and common thief in Northern Italy under Todorovic's exploitive gaze. Completely caught in the middle is Azra, the girl next door, whom he marries at last, but cannot trust. At turns tragic and comic, realistic and touching on magic realism (Pehan, for instance, has telekinetic powers that come into play for the unusual revenge scene at the end), Time of the Gypsies is also a vibrant hymn to the "time of cinema" on the big screen with big sound and big themes—the homeless, the downtrodden, the importance of love, self worth, loyalty and friendship. It almost seems not an accident that this film came out the same year as Cinema Paradiso which also celebrates the power of cinema through a male coming-of-age tale. Kusturica's film is the more tragic simply because the Balkans themselves are more troubled than the sun drenched lands of Southern Italy seen in Cinema Paradiso . But, rather than depressed, the viewer comes away with an admiration of a simple tale told with such elaborate gusto as well as with appreciation for what a filmmaker working at the peak of his powers can do with the craft and art of cinema. For while this film is firmly rooted in the Balkans, it is also a tribute to world cinema. Kusturica has made it abundantly clear that he is strongly influenced by John Ford, Luis Bunuel, Coppola, various Russian and Czech directors (he was educated like many Yugoslav directors of his generation in Prague at the well-known FAMU Academy) and Chaplin. For all the heartbreak and humor, the final image of this troubled epic is of the Uncle figure, back to the camera, jacket clutched around him, doing a funny little walk, going away from us, looking amazingly like Chaplin going down the road of life as he did in the final shot of almost all of his films. For Chaplin too played the Outsider, the Homeless One, the Unlucky in Love fellow who survives and hopes and travels.